With the latest expansion "Vault-Tec Workshop" for Fallout 4 you can build and manage your own bunker as in Mobile Game Fallout Shelter. In this guide we will show you how you can build Vault 88. There are four new workshops in the DLC. As to the surface you can also assign settlers and build supply lines. In this case Vault 88 has three entrances. - Main entrance with the large round vault door. - A by-pass in the northeastern sector leads you to the University Point. - A side access in the northern sector leads you to Milton General Hospital. First of all, you must clear the Vault 88 and can use the scrap items. In addition, you need to build steel, rubber and ceramics. Steel you get through the recycling in Vault 88. Supply of rubber and ceramics can get through the deliveries of Doctor Sun and Myrna in Diamond City. If you still have a few skills points available, you should definitely invest in the Strong Back Perks. - Requires 6 points in Strength - Strong back perks: You get more carrying capacity. Rank 3 (from Lv 20): Are you overweight, you can use running action points. Rank: 4 (from Lv 30): You can fast travel if you are overweight. Rank 5 (from Lv 40): If you are overweight, running costs 50% less action points (New DLC "Far Harbor"). - Requires 5 points in intelligence - Recyclers: When recycling of weapons and armor you can receive rare components. Rank 1: When recycling of weapons and armor you get rare components such as screws, aluminum and copper. Rank 2 (from Lv 23): When recycling of weapons and armor you get rare components such as circuits, nuclear material and fiber optics. Objects with favorite components are highlighted. Rank 3 (from Lv 40): You gain the ability to cannibalize more objects (New DLC "Far Harbor"). All new items that have come with the DLC you can use in other settlements outside of Vault 88. Among the most practical new workshop objects include a terminal with that you can manage your population. So you can recruit settlers directly and assign them work. In addition, you can also use terminal to locate your companion. 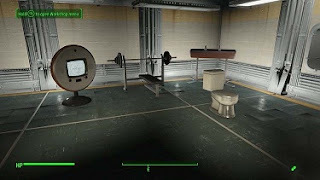 - Pommel Horse: This sports equipment can use for physical training of your Vault Dweller and also benefits from Agility bonus. - Bench: Another training device that gives you when using a Strength bonus. - Decorations: To embellish your Vault, you can use new decorative items such as posters or tall Vault Boy figures. In addition, many old decorative items are now available in a cleaner state. - Generators: For sufficient energy in Vault 88, you can use the new Vault-Tec reactor and Vault-Tec Super reactor as they produce 150 or 500 energy. For the construction you need a lot of nuclear material, this can be found in the Uranium-caves, which are distributed over the vault. - Structures: New Vault structures ensure the typical bunker look and you can build rooms with their own designs. - Vault 88 is huge and there are many hidden corners to explore, which are covered by debris. Therefore, in the workshop menu run through the Vault and recycle everything you can. - You should always keep a good weapon ready when you explore a new area. You may encounter monsters such as RAD-scorpions and luminous deathclaws in hidden areas. - You can build a vault in all other workshop settlements, but only above ground. Vault 88 is the only place in the Badlands where you are allowed to build underground bunkers. - With the new DLC you can also perform experiments on your settlers. There are four experiments (power cycle 1000 Phoropter, soda fountain and Slot Machine) with corresponding prototype objects that unlock during the quest line. - If you want to perform an experiment, you need the object with a terminal connect. The results you can then see in the computer at the desk of the overseer.